Here is my quinoa salad recipe that leaves you feeling energized. I highly recommend this meal if you exercise as its ingredients contain nutrition elements that help your body recover on the cellular level. It contains loads of Manganese and Vitamin K, Magnesium and Vitamins B that are necessary to build muscle tissue and strengthen your bones (among other benefits). 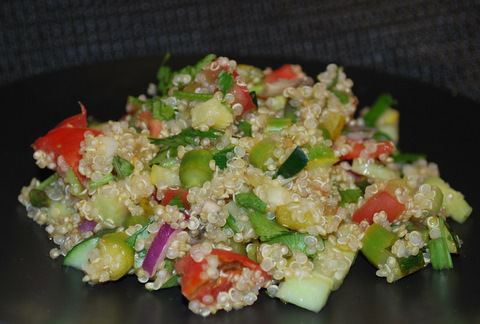 This quinoa salad stores well, and has only good calories in it, which makes it a great lunch box choice. It is so juicy and delicious that it can be eaten without oi. Of course, if you are not on any kind of healthy heart or weight loss diet, this fact doesn't mean much to you. You can add very little flavoured oil, such as oil from the sun-dried tomatoes or unfiltered olive oil just for the taste. I usually add flax oil to my salads for healthy omega-3 essential fatty acids. My logic is that if i have to eat fat, it has to be the healthiest variety. By the way, if you use Borner mandoline slicer, you will get your veggies shredded much faster, and you won't even need to touch that onion. Enough quinoa salad for 4 people as a main meal; or for 3 people as a side dish plus 2 lunch boxes! Rinse quinoa, and boil it with water and (optional) some oil on the sausepan until half-cooked (~10 minutes). Cut zuccini, garlic, and asparagus. Open the lid, add garlic; mix quinoa, and place zuccini and asparagus on top of it. Squeeze lemon quice and salt the veggies. Don't mix anymore, until it consumes all water. Cut tomatoes, onions, cilantro, celery, and pickles. You need juicy tomatoes for this salad, not necessarily heirloom type, although they taste wonderful. Mix in the bowl. Transfer quinoa into the bowl while warm, add salt and olive oil. Mix well.